Everything wasn’t coming in pairs today. But quite a lot of it was. Two Mercedes SLKs, neither with the benefit of an autobox. The 29k mile 06 SLK 200K in the photo sold for £11,950. 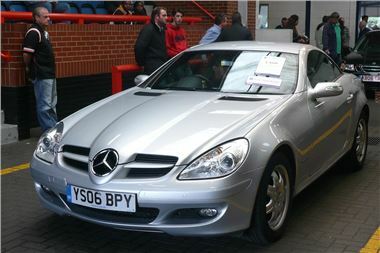 The 20k mile 2007/57 SLK 280 made £13,000. These pretty roadsters are now becoming increasingly affordable. Two Golf Plus (how often do you see two of them). The 25k mile 05 1.6FSI DSG made £5,600. The 45k mile 2007/57 1.9TDI sold for £7,850. Two 08 Fiesta Style Climate 5-doors, and someone might have made a mistake here because the 14k miles sold for £4,700 and the 15k miler for £5,350. A pair of black Ford Ka Style Climates. The 18k mile 2007/57 sold for £3,700 and the 18k mile 2008/57 for £3,800. Not a lot of difference there. While a difference of 80,000 miles between an 89k mile 2005/55 BMW 320D SE and a 169k mile 2006 BMW 320D SE made £1,850 difference to the prices they fetched.